Hi Folks, Welcome to the website of Gateway International Missions! Thank you for taking the time to stop and let us introduce you to a Modern-Day Book Of Acts Ministry! I know that you could have chosen literally thousands upon thousands of websites, but you chose to visit us. Gateway International Missions is located here in the foothills of North Carolina, while our primary ministry is in 14 African countries on the Continent of Africa. Africa has 54 countries with almost one billion people presently. My wife, JoAnne, and I have been working nonstop in Africa for almost 30 years, and my, how God has blessed. Personally, I have made 67 trips to Africa, but our primary work is done by our almost 50 African nationals. Our primary ministries are in the prisons, schools, slum orphanages, and also in planting churches. Just over 15 years ago, JoAnne and I took over this ministry from a dear couple in Florida, Mickey and Alice Parrish, and then we changed the name to GIMI. When we assumed responsibility for this great work, we had only two countries in Africa, while today we now work in the 14 which I mentioned. We are so thrilled at what God has done and is doing through GIMI. During the past 15 years, we have shared the Gospel message with almost Eight million people while we have seen 1.7 million people pray to receive Jesus Christ as their personal Savior. We sincerely give God all the glory for what He has done. And, we want to invite you to not only view our website, but also to involve yourself in GIMI by praying for us, by giving financially to this ministry, and even by possibly joining us for one of our evangelistic mission trips which we believe will be "the mission trip of a lifetime" for you and any Christian friend that might want to accompany you. We invite you to spend a lot of time on our website, and if you have questions that are not answered on the site, please contact our offices at 828-632-2344 or my personal e-mail at gimi@charter.net and we will be happy to answer any questions you may have. Again, thanks for getting a vision of what God is doing through the ministry of Gateway International Missions. We are so privileged to be Ambassadors For Christ, and we just can't wait to see all of the people in heaven who have come to Christ through GIMI. May God use our website to give you a compassion for souls and a passion to help us. We love you in the Lord! Gateway International Missions is a relatively young ministry which was officially organized in 2002. 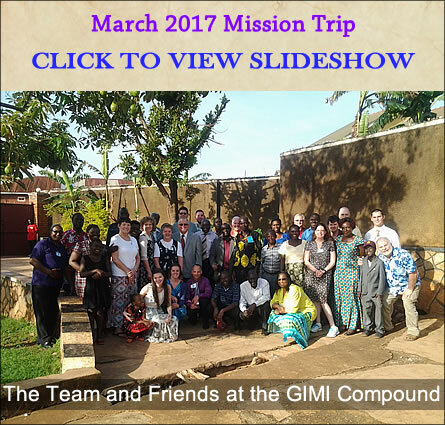 Yet, the actual ministry of GIMI has its roots in the faithful and dedicated service of a wonderful Christian couple, Mickey & Alice Parrish of Jacksonville, Florida. They started working in the prisons of Kenya in 1976, and later the prisons of Uganda in 1984 – right in the midst of Uganda’s last war. At that time, Mickey & Alice were associated with Christian Light Foundation, a mission organization located in Jacksonville, Florida. CLF was instrumental in helping Mickey & Alice develop this great ministry in Kenya and Uganda. Mickey & Alice lived in Africa for many years, then moved back to Florida where they continued to supervise this wonderful ministry for Jesus. In 2001, they decided that it was God’s will for them to turn the ministry over to someone who had a tremendous heart for Africa and would continue to faithfully carry on this marvelous program of evangelism and discipleship in East Africa. Because of the numbers of trips that I had made to Africa since 1985 to work with Mickey & Alice, God gave me that tremendous burden and passion for Africa which resulted in Him leading me to accept the leadership and supervision of this entire ministry. In spite of the heavy demands that have been placed upon my time and energy, I have never been more blessed in the work of God. I am blessed beyond description. And, I want Jesus to bless you as you view a small amount of what God is doing through Gateway International Missions. 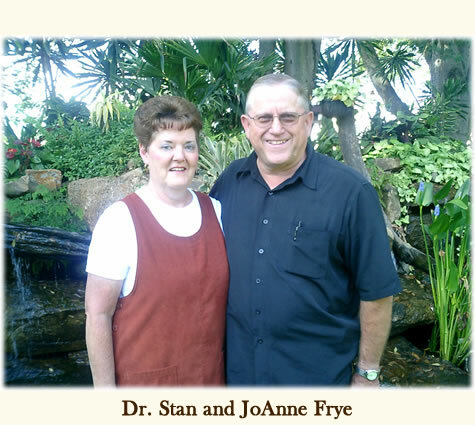 Dr. Stan Frye – President of Gateway International Missions, Inc.